Pain. We all have it sometimes. Some have it all the time. It’s that uncomfortable sensation in your body that tells you that something is wrong. 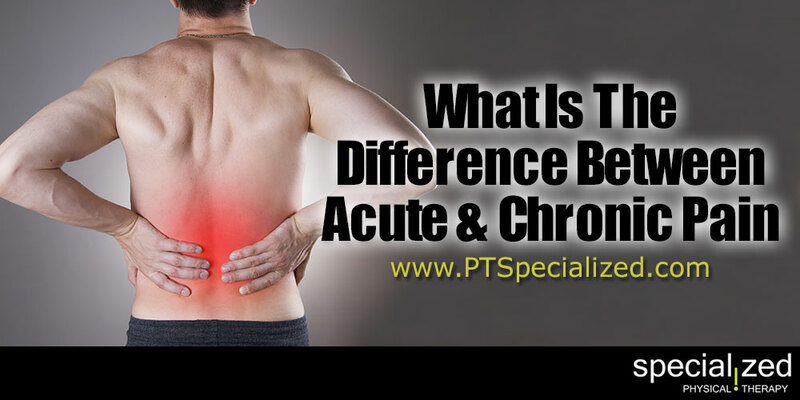 Whether an injury or illness, pain is classified as either acute or chronic. So what’s the difference? Acute pain is pain that begins all of a sudden and is sharp. It grabs your attention. Usually associated with an injury, it can also be a warning of illness or threat to your body. It could be caused by breaking a bone, burning your tongue on hot soup or, if you’re a woman, childbirth. It can be just a mild momentary thing or severe and last much longer. Once the underlying cause is found and addressed, the pain should subside. However if it doesn’t, it becomes chronic. Chronic pain is pain that persists despite there being no underlying cause. Sometimes this happens despite the underlying cause no longer being an issue. With chronic pain, the pain signals to the nervous system stay active for weeks, months or even years. Physically this can cause muscle tension, mobility issues, lack of energy and even depression, anxiety or anger. Chronic pain is often found as headaches, back pain, arthritis, pain from damaged nerves (from illnesses like shingles) or psychogenic pain which is pain from an unknown source. Obviously both kinds of pain can be debilitating. The main difference between the two is that one goes away and the other doesn’t. There may be no cure for what causes the chronic pain, as with arthritis or fibromyalgia. It can be treated. Acute pain should be treated immediately. It is often a sign of a serious underlying injury or illness, and should be seen by a medical professional. Chronic pain should also be checked out by a doctor. Along with medication like NSAIDS, acetaminophen or stronger narcotic pain medication, physical therapy can be very helpful. Not only can physical therapy help stretch and loosen the muscles in the affected area, it can also help you learn how to recognize the signals your body sends and make adjustments to lessen chronic pain.